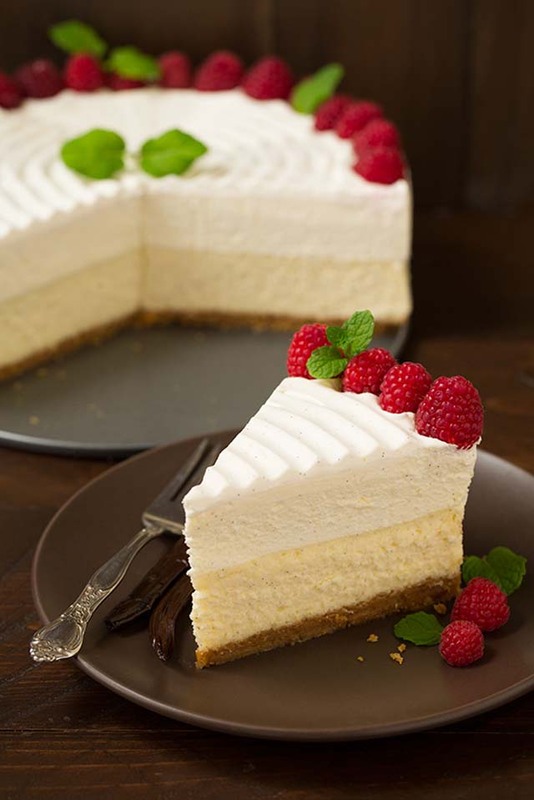 This is my favorite cheesecake I’ve ever had and my husband said the same thing! You know you want your pie to be the first to go this Thanksgiving, so here’s what you do – make this perfectly delectable, purely irresistible Vanilla Bean Cheesecake instead of pie. Yes you heard that right, take a break from the classic pie everyone makes at Thanksgiving and bring this over-the-top vanilla bean laced cheesecake instead. In my opinion it outdoes any pie, in fact it outdoes any cheesecake! 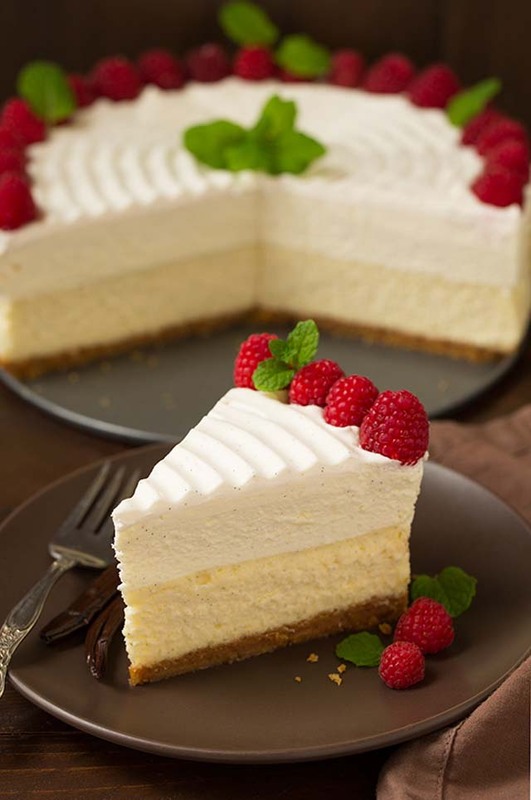 This is my favorite cheesecake I’ve ever had and my husband said the same thing! 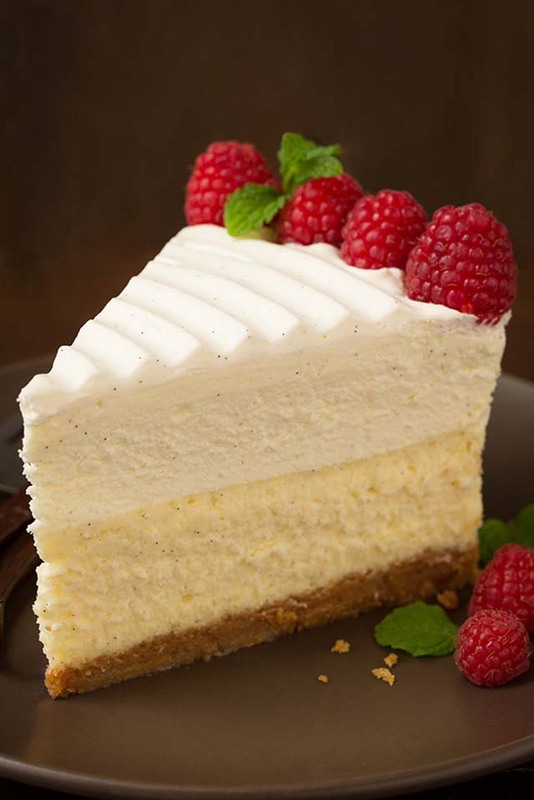 It’s been a while since I’ve had a slice of the Vanilla Bean Cheesecake at Cheesecake Factory but this is just what I remember theirs to be and then some. You get a buttery graham cracker layer, a rich melt-in-your-mouth vanilla bean cheesecake layer, a sweet white chocolate mousse layer and a fluffy whipped cream layer. 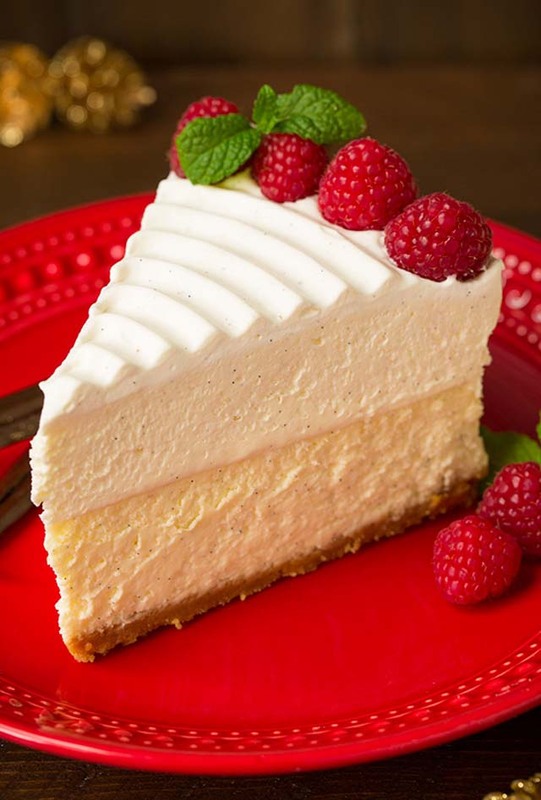 It is Heaven in four layers of cheesecake bliss and trust me you don’t want to skip trying this recipe at least once before the years is over! So good you’ll lose all self control. Normally, since I make ridiculous amounts of sweets, I can eat for example half a cupcake and so forth – this, no way! Bring on a big slice. Worth the splurge and every calorie. Preheat oven to 350 degrees. Line the outside of a 9-inch springform pan with a sheet of 18 by 18 heavy duty aluminum foil (make sure the foil has no holes, you don't want any water to leak in). Add graham crackers and sugar to a mixing bowl and stir to combine, then pour in butter and mix with a fork until evenly moistened. Pour into prepared springform pan and press evenly into bottom. Bake in preheated oven 10 minutes, then remove and cool on a wire rack. Reduce oven temperature to 325 degrees. Have a large roasting pan ready and boil about 4 quarts of water (you may not need all of it). In a mixing bowl using an electric hand mixer blend together cream cheese, sugar and seeds of 2 vanilla beans just until smooth (scrape down side and bottom of bowl occasionally throughout entire mixing process). Mix in eggs one at a time, mixing just until combined after each addition. Add sour cream and heavy cream and mix just until combined. Tap bowl forcefully against countertop about 30 times to release any large air bubbles. Pour over cooled graham cracker crust and smooth into an even layer. Place cheesecake in roasting pan then place roasting pan in oven and carefully pour in enough boiling water to reach halfway up the side of the cheesecake pan. Bake in preheated oven until cheesecake is set but still jiggly in the center, about 65 minutes, then leave in oven and leaved door closed and let rest 10 minutes. Then remove from oven and cool on a wire rack for 30 minutes. Tent with foil and chill in refrigerator 8 hours or overnight. Melt white chocolate in a microwave safe bowl on 50% power in 30 second increments, stirring between intervals, until melted and smooth (or alternately melt in a double boiler). Set aside and let cool until just lukewarm. In a mixing bowl using an electric hand mixer whip heavy cream until soft peaks form then add sugar and whip until stiff peaks form (the cream should get to the point where it's starting to lose that wet sheen and it should become quite thick. Tap excess cream of beater blades), set aside. In a separate mixing bowl whip cream cheese with seeds of vanilla bean until smooth. Mix in white chocolate (it may appear slightly gritty, that's fine). Add in half of the whipped cream mixture and fold with a rubber spatula until nearly combined, then add remaining half of the whipped cream mixture and fold until combined and no streaks remain. 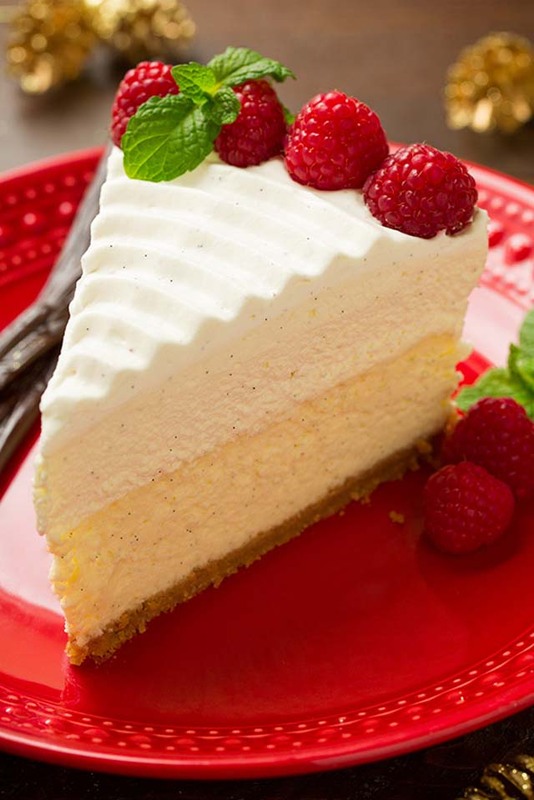 Pour over cold cheesecake and spread into an even layer. Tent pan with foil then return to refrigerator and chill 1 1/2 hours. In a mixing bowl whip heavy cream with seeds of 1/2 a vanilla bean if using until soft peaks form. Add sugar and whip until stiff peaks form. 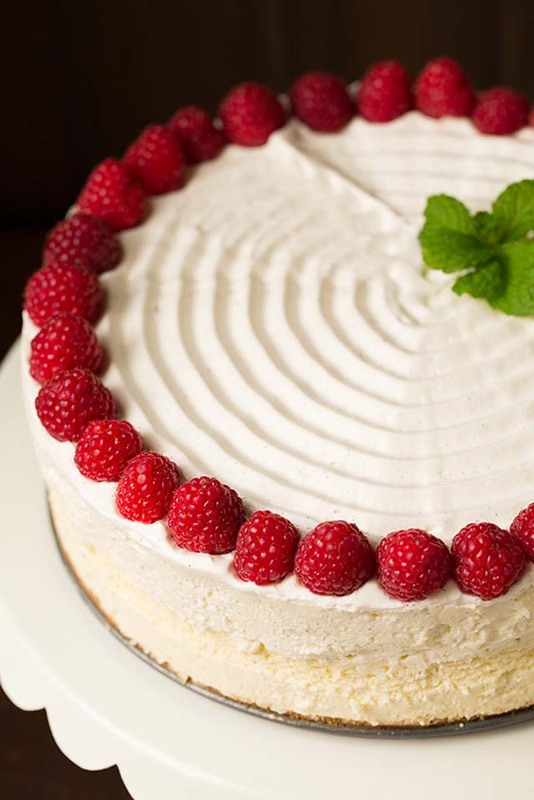 Run a knife around edges of cheesecake then spread whipped cream over mousse layer within 2 hours of serving. To serve remove foil from pan, pull latch and remove springform pan ring. 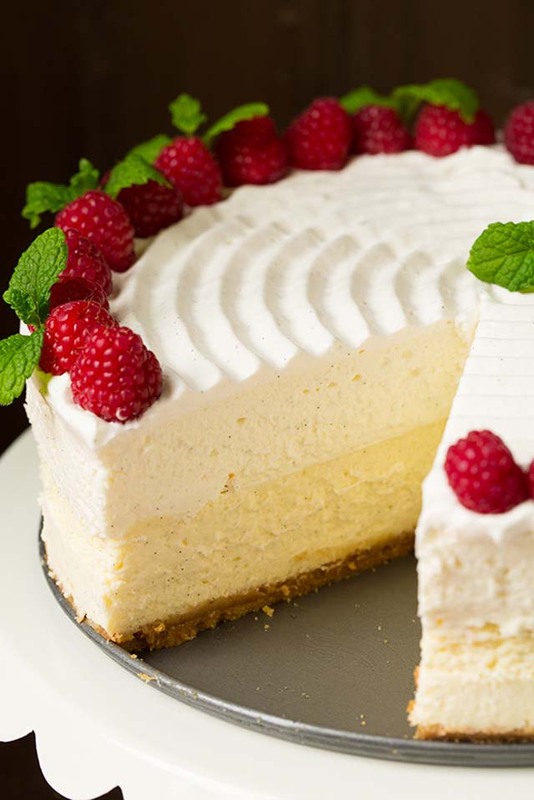 Garnish with raspberries and mint if desired, cut into slices.